Only worn in the actual ceremony, this is the most formal kimono for Japanese weddings. 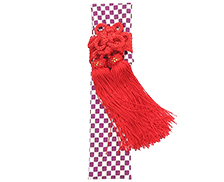 This traditional style has its origins in the wedding ceremonies of samurai society. From kakeshita (wedding kimono) to komono (accessories), arrange your wedding outfit entirely in white. In ancient times white was considered the sacred ‘color of the sun’ and, in weddings, symbolizes the bride’s purity and gentleness of heart. While some believe it also signifies ‘taking on the colors and customs of one’s new family’, it is clear that wearing white draws out the bride’s refined inner dignity. 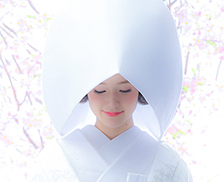 A tsunokakushi (bridal hood) or wataboshi (bridal headdress) will be added for the ceremony. A formal kimono of the same rank as shiromuku. 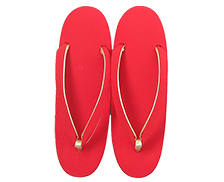 Enjoy choosing from our beautiful array of colors as well as from the various auspicious patterns available. It is said that this tradition was started by families of wealthy farmers and merchants imitating the samurai class. 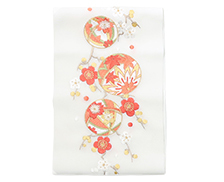 It refers to a long-sleeved (furisode) kimono with a dragging (hiki) hem. It is also called ‘ohikizuri’ (dragging kimono). This kimono features a ‘fuki’ (edge of the hem) that has been stuffed with cotton to prevent the hem from becoming tangled with the legs while walking. Don’t forget to put on your tsunokakushi for the ceremony! The groom's kimono is usually black and has his family's symbol embroidered on it in white. The kuromontsuki is the most formal and traditional garment for men. This manly, neat figure is suitable to a glorious day. Only used during wedding ceremonies. Unlike wataboshi which can only be worn with shiromuku, tsunokakushi can be arranged with any formal dress. 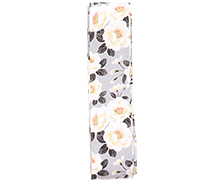 A knife kept in a decorative cloth case and tucked in the obi. This was originally carried by samurai noble women for self-defense. Today, it acts as an accessory and is worn below the breast to give the outfit a special charm. Regardless of the color selected, all of the obijime we use are filled with a cotton center in a style known as ‘maruguke’. Also known as ‘kanoko’. Although this was originally used as a practical tool for tying obi, today it is worn as a decorative piece under the breast. A white obiage is used for shiromuku. A folding fan held by the bride. ‘Suehiro’ derives from the saying ‘may your happiness spread forth like a fan (suehirogari)’. While these fans are not for practical use, their inside has been colored gold on one side and silver on the other. 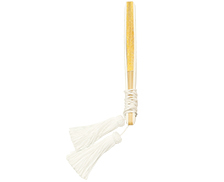 The general custom is to keep the gold side facing outwards when carrying the fan or wearing it below the breast. When used with shiromuku. A thin obi wrapped below the main obi. 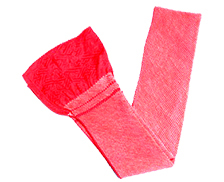 Kakeobi are primarily used to hold up the kimono’s hem. The higher the heel, the more gorgeous the impression. 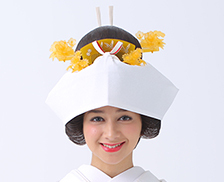 In general, the bride’s zori are gold but with shiromuku white zori will be provided. Haneri are used with hikifurisode and furisode kimono. 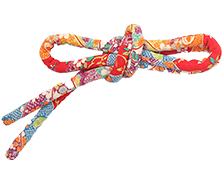 Attached to the collar of the ‘jiban’ (kimono undergarment), this collar accentuates the area around the face. 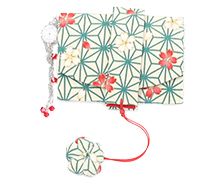 An item carried when wearing hikifurisode. Similar to a cosmetic bag, hakoseko derive from the pouches female members of samurai families put their makeup in and carried around in the latter half of the Edo period.